But I am grateful for people like Daniel M. Shapiro who remind me that the world isn't a complete garbage can. Thanks, Dan. Daniel and I spoke before the election, so we don't get into that here. But I know my dogs have been a reliable source of comfort since Tuesday, so I'm glad we get the chance to honor our small companions and talk about poetry because, dammit, something has to get us through. A little about Daniel M. Shapiro: he is the author of Heavy Metal Fairy Tales (Throwback Books, 2016), How the Potato Chip Was Invented (sunnyoutside, 2013), and The 44th-Worst Album Ever (NAP Books, 2012). Some of his recent work has appeared in Ink in Thirds, Bitterzoet, Uppagus, and Forklift, Ohio. He is a senior poetry editor and reviews editor for Pittsburgh Poetry Review, and he interviews poets at Little Myths. Tell us a little about how your pupper Pepper came into your life. Our 13-year-old golden retriever, Heidi, had died more than five years ago, and I was distraught to the point of telling my wife, Kris, that I didn’t think I would want a dog again. 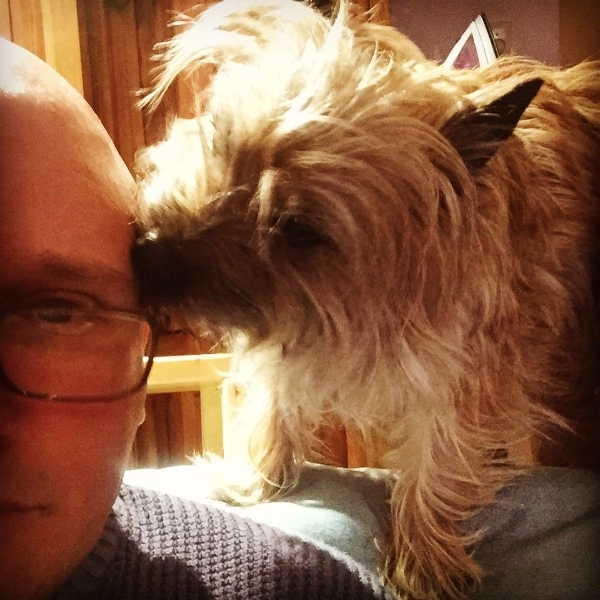 Previously, we had discussed getting a cairn terrier, but I had wanted a rescue dog and thought it would be unlikely to find a cairn that way. 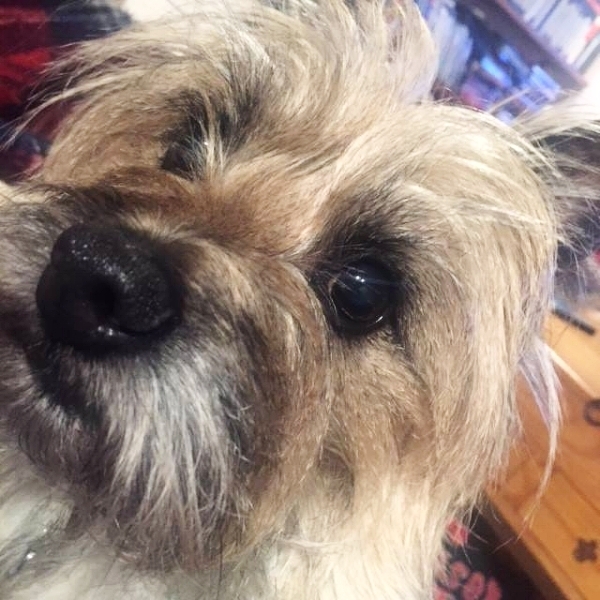 A couple of weeks after Heidi died, Kris sent me a link to a cairn rescue home page with a picture of an absurdly cute dog, and she wrote, “Maybe we could get one like this sometime.” Even though I had sworn off dogs, I wrote back: “I don’t want a dog LIKE that one. I want THAT one.” So we drove a couple of hours to Ohio and picked her up. She was wormy and weighed 2 pounds. She looked like a Beanie Baby. What’s the biggest perk of having a dog? The biggest drawback? The biggest perk is that you get to have a family member that provides unconditional love. She’s perceptive and knows when people need to be left alone or want cuddles or kisses. I don’t think there are any major drawbacks. I don’t like having to board her when we go out of town, but that’s probably it. Has Pepper had any influence on your writing? If so, how? I think she has influenced me by helping to provide a comfortable setting. I always write in the same chair, I always put my feet up on an ottoman, and she almost always lies there on top of my legs. She contributes to the right mindset to write. "I don't want my poems to suggest I have lived or felt things that belong to other people." If you had to describe your poetry wheelhouse – topics you’re most likely to write about – what would it be? Anything you try not to write about? My wheelhouse is typically rock or pop music, but it has included other elements of pop culture. I have some new poems based on board games, for example. I try not to write about topics or themes I’ve seen repeatedly, such as nature. I feel like I would be competing against everyone else who has done that, and I wouldn’t have anything to add. I also avoid topics I’m interested in but don’t believe I’m the appropriate speaker for; I don’t want my poems to suggest I have lived or felt things that belong to other people. True or false: a poem has changed your mind before. Probably 10 years ago or more, I started to read books by Russell Edson, James Tate, and others who blurred the boundaries between poetry and prose. They broke what I had considered to be rules I never would’ve considered breaking, and their poems encouraged me to be more open to whatever structure or odd subject matter suited my needs as a writer. Now I write more prose poems than anything else. As an editor for Pittsburgh Poetry Review, you’re no stranger to slush. What are the hallmarks of a poem you’d want to publish? I am drawn to poems that express the individuality and/or specific obsessions of a poet but that covertly reveal an element of universality. I find that a lot of writing uses the opposite approach; it’s more dedicated to universality, and the unique ideas or experiences of the poet are secondary. The latter scenario can create a sameness in the submissions we see. One of the best poems we’ve published in PPR was about baseball, but of course it wasn’t about that only, and you could argue it wasn’t about it at all. The poet blended her love of baseball with the culture of where she grew up, her adolescence, her relationship with her father, etc. So I got a sense of why only that poet could write that poem, but the drive of the language, combined with “America’s pastime,” provided a broader appeal, as well. "The best poets can rearrange topics I tend to avoid—e.g., religion, which usually inspires a kind of emotional shorthand—and find something in the topics I never would’ve seen without their help." And a follow up: any pro tips on checking an aesthetic bias while reading submissions? If a poem covers a topic I think has been done to death, I focus on the poet’s approach. Are the trees really trees? Maybe a poem starts as a conventional tree poem, but the trees become vengeful and start to kill people who are ruining the environment. Turn the tree poem upside down, and I’m there. If it’s a dead cat poem, will it become a zombie cat poem (please?)? The best poets can rearrange topics I tend to avoid—e.g., religion, which usually inspires a kind of emotional shorthand—and find something in the topics I never would’ve seen without their help. What do you think is the best poem you’ve ever written and why? I don’t know if it’s my best poem, but my favorite poem I’ve written is called “Don Knotts Returns to His Hometown of Morgantown, W.Va., 1982.” I like it because people always laugh when they hear the title, but eventually they realize the poem is quiet and sad. I like how the poem can be many things: silly, poignant, surreal, journalistic, etc. A metaphor or simile for Pepper? Pepper is like a neighborhood bar: occasionally deafening, filled with love, on the verge of a pratfall, and all-out fun until she winds up in a deep sleep.